Need Help Resolving IRS Debt? 90% of tax resolution firms will tell you that you qualify for an Offer In Compromise, or that you can settle for less than is owed to the IRS for a fee of $4,000 to $6,000, regardless of whether or not you have a legitimate chance of qualifying for an offer in compromise. If you don’t qualify for the IRS’s Offer In Compromise program, a Payment Plan may be the way to resolve your problem. This is an agreed settlement between the taxpayer and the IRS, based on the National standards to determine what amount the taxpayer will be paying the IRS each month, but allowing the taxpayer to afford food, housing, clothing, medical and transportation expenses. It’s a complicated formula that has to be calculated. In most cases, the National standards do not have to be used for the first year. The taxpayer’s actual expenses can be used. The IRS then allows the taxpayer one year to come into compliance with the National standards. This is not something that the IRS will inform you of or assist you with. This is another reason why it is essential to obtain professional assistance from Federal Tax Professionals with this matter. Most citizens do not realize that the IRS must consider their current income situations when asked for a payment plan. The automated collections group ACS Collections at the IRS will not inform you of your rights. They will let you enter into a payment plan that they know you can never afford. Federal Tax Professionals will do everything possible to get you a payment plan with the best possible terms. Properly prepared IRS documents are essential to this process. Fortunately for you, Federal Tax Professionals knows how to prepare the documents and submit them, along with the proper supporting documents to swiftly resolve your situation. Shown below is an (extreme) example of just how effective we can be. 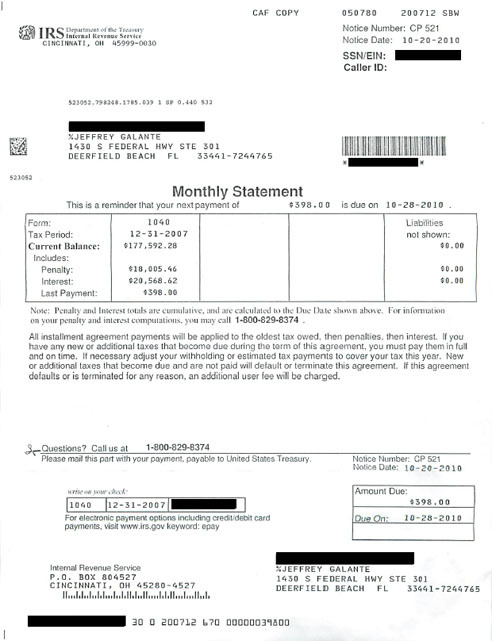 This client owed the IRS $177,592.28. Federal Tax Professionals successfully negotiated a payment plan of $398.